The Haven is just what the name implies. This 180 acre subdivision is tucked away in south Shreveport, between the Red River and E. Bert Koons, and offers residents uparalleled beauty and serenity. Meticulously landscaped, with shimmering lakes and sprinkled with weeping willows, the Haven offers both garden homes and custom built homes in the neo-ecclectic style. The Haven is not only on the river but actually offers waterfront property and a private boat launch for residents. The three lakes in the neighborhood are stocked with fish and are accented with fountains. The homes have very small but well decorated yards, which are maintained by the Homeowners Association, as well as the three miles of lighted walking trails. At the front gate, there is a guard house with friendly 24 hour security, providing extra safety for your family and property. And the levee the neighborhood sits behind provides a great noise and light barrier from LSUS and East Kings Hwy. The Haven is less than a mile from the most popular shopping and dining in Shreveport/Bossier, and is also only a few short minutes from two state-of-the-art medical centers. The Haven is also located in one of Shreveport’s most ideal school districts. The sound of fountains and the sway of the willow branches will leave a lasting impression on you. 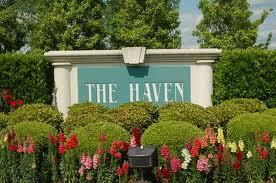 To live in The Haven is to enjoy safety and convenience in the heart of South Shreveport.